Yo ho, matie! All hands on deck! Do you have the supplies? The clear plastic bottle, the oil, the blue food coloring, and some water? All right then, you scrubbie. Let's sail! Oil in bottle.Pour the oil in the bottle. Water, oil, and food coloring in bottle.Pour the water in the bottle. Add about 15 drops of food coloring. Screw the cap on the bottle tight, tight, TIGHT! Oil and water separates.Shake the bottle. Mix the ingredients all up. Let it sit for a bit. Have you ever heard the saying, "Oil and water don't mix?" Well, they don't and this project proves it. Notice how the food coloring has blended in with the water? Watch the color change from stormy green to clear blue, just like the sea! Oooo...erp....where did I put that sea-sick bag? 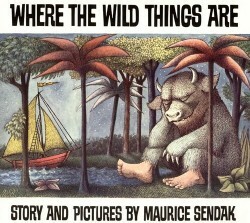 This week's activity has been inspired by the book-made-into-a-movie Sendak's Where the Wild Things Are. (I hope this post isn't any kind of spoiler.) I recalled this activity when I watched Max in his boat thrashing about as he sailed to the land where the Wild Things lived. He braved some pretty violent waves, didn't he? Let's see if we can recreate the wavey and wild thrashing about on a much smaller scale. Shall we? Let's head back into my kitchen again to gather the supplies needed for tomorrow's rumpus. You'll need a clear plastic bottle, cooking oil, blue food coloring, and water. I added a funnel for easy pouring and a paper bag just in case the waves get too wild and your tummy gets upset.